Rather than discouraging me, her drawing inspired me to work harder. Over the years I improved, but with no lessons or help, I only progressed to a point of being ‘okay’ as an artist. I sold a couple of charcoal drawings of wildlife, but never enough to make a difference. After school, I got married, raised three wonderful children, and the art fell by the wayside. Then, in 2015, my mom invited me to take a pastel class with her. Memories of the half-decent art made me think this would be a cakewalk, although I’d never used pastels. As the class was winding down the instructor came by and asked how I liked pastels. I made some noncommittal sound, and she asked what I didn’t like. I told her the painting was UGLY, and she drew me to the back of the class, about ten feet away and made me turn and look at my painting from a small distance. In that moment, I learned the most important lesson of all: always step away and look from a distance. When we are close to our work, we cannot see the big picture. Pastels are now my favorite medium. They’re easy and mostly forgiving. I love them for landscapes, seascapes, nocturnes, and mixed media with gold. 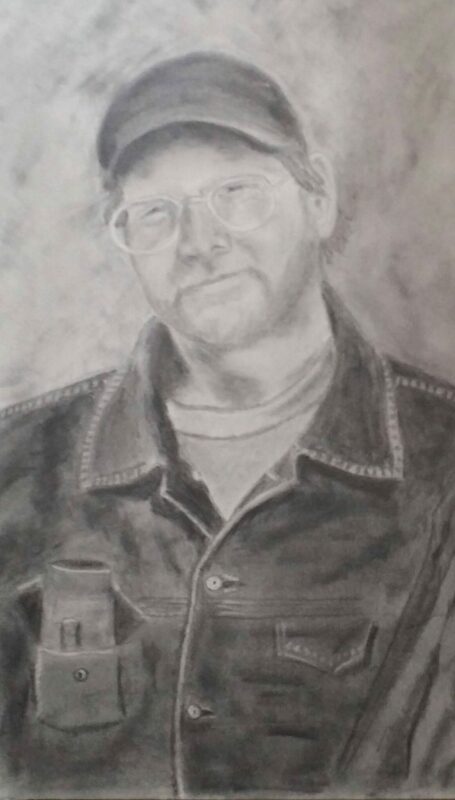 Graphite is a replacement for the charcoal that I used to use as a child, and is the medium for most of my portraits. I primarily use powdered graphite, but am looking to expand my experience with pencils and also to try other subjects. Colored Pencils are my medium for high detail, and is the most difficult medium for me. It requires much more patience than pastels or graphite. But I’m becoming more fond of them as I gain more experience using them.